Looking for a compact engine to fit in your scale aircraft’s cowl? This 4-stroke might be the right answer: it offers the power of a larger, 2.00-size engine but is the same size and weight as most 1.20-size 4-strokes! 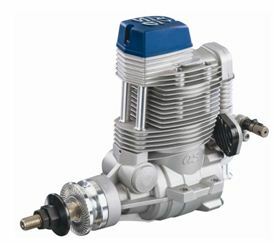 The O.S.® Engines 155FS-a 4-stroke engine is designed to give more power from a smaller package. The 155FS-a produces 2.6 horsepower – about the same as many 200-size power plants – from a package that’s about the same size and weight as most 120-sizw engines! Fewer modifications and easier retrofits leave you with more time to enjoy the added performance. And since the 155FS-a is a pumped 4-stroke, you’ll be able to enjoy improved performance consistently – regardless of model attitude, fuel levels or tank position. All of this with easier maintenance – and less of it! Instead of venting oil through a crankcase tube, the 155FS-a recirculates it which improves lubrication of the working parts and prevents oil from getting all over the cowl. Any way you look at it, the 155FS-a is a great choice for giant-scale modeling.